This impressive Italian-style building, constructed in 1819, dominates Hamilton. The clock tower was added in 1887 to commemorate the golden jubilee of Queen Victoria. 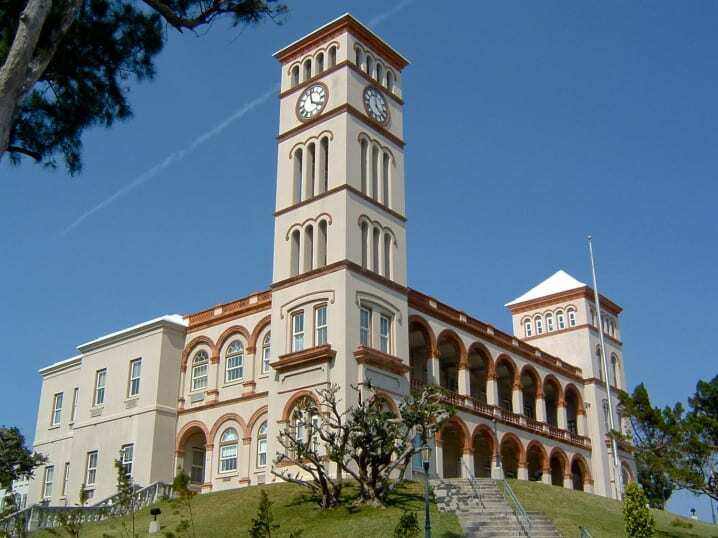 Sessions House is the home of both Bermuda’s House of Assembly and Supreme Court. The House of Assembly meets on the second floor and is the third oldest parliament in the world. The layout is much the same as that of its British equivalent, the House of Commons. The two major political parties sit facing each other and presided over by a speaker. Wearing a long black robe and wig, it is the speaker’s responsibility to maintain order during parliamentary debates. If the scary outfit isn’t sufficient to keep the rabble in check, the speaker is also armed with a silver mace, a blow from which should subdue even the rowdiest of members. The house is open to the public on weekdays but catch it at its liveliest by getting a seat in the public gallery during parliamentary sessions (from 10 am onwards, Fridays, November – June). The House of Assembly hasn’t always been here. When the island was first colonised, St George was the capital. The first parliament met in 1620 at St Peter’s Church but later moved to the State House. In 1815 Hamilton became the capital and parliament moved to the old Town Hall on Front Street until Sessions House was completed. Sessions House is situated on Parliament Street in the centre of Hamilton, just behind the Cabinet Building. It takes about 5 to 10 minutes to walk here from either the bus station or ferry terminal. Its clock tower is one of the most conspicuous structures in the capital so you really can’t miss it. Map showing location of Sessions House. A very nice building. Didn’t do the tour but wandered around the grounds. Next time we are in Bermuda it would be great to look inside and see how the parliament works. 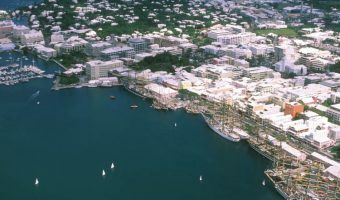 The oldest building in Bermuda and the former home of parliament.